Welcome to day22# of my Countdown To Christmas Cookie Recipes. 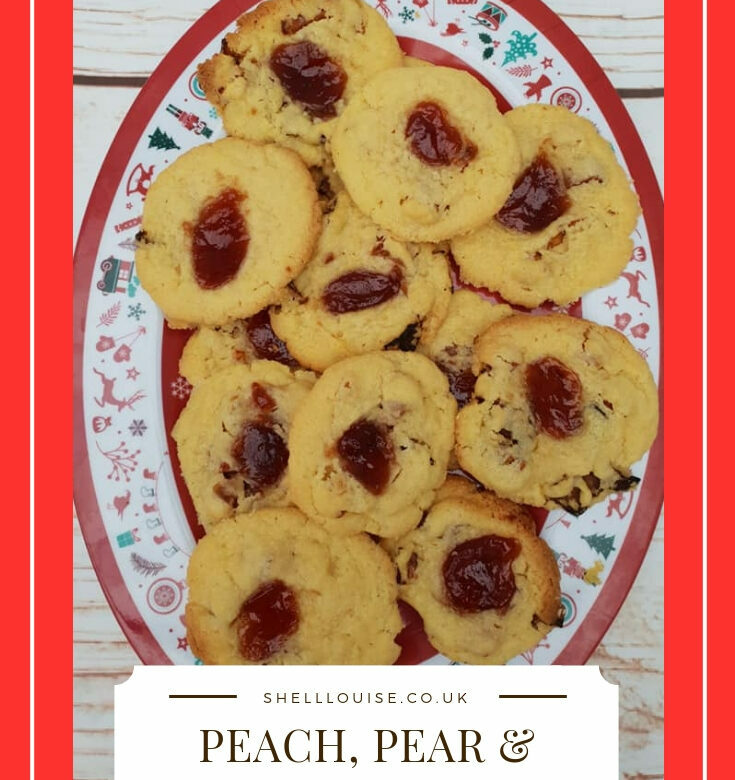 Today’s recipe is for Peach, Pear & Plum Cookies. Tomorrow’s recipe is for Cinnamon Orange Crisp Cookies. Put the butter and sugar into a bowl and mix well with a wooden spoon, then beat in the egg yolk and almond extract. Sift together the flour and salt into the mixture, add the dried fruit and stir until thoroughly combined. Scoop up tablespoons of the mixture, roll them into balls and place on the prepared baking sheets, spaced well apart. Make a hollow in the centre of each with the dampened handle of a wooden spoon. Fill the hollows with jam. Bake in the preheated oven for 12-15 minutes, until light golden brown. Leave to cool on the baking trays for 5-0 minutes then using a palette knife, transfer to wire racks to cool completely.